Are you measuring performance of your IT strategy? Strategic formation and strategic thinking are household expressions and are applied to every possible scenario to underline the importance of an initiative. Workshops are conducted and consultants engaged to figure out which strategic direction is the right one and should be pursued. This is followed by compiling a strategic plan document. Once this document is compiled, day-to-day activities take over again and nobody really follows through on implementation. Most strategic plans, never having made it to the implementation stage, begin to collect dust. The reason is twofold. First, it is challenging to break down the strategy into activities such that they will be performed with discipline over a length of time. Too often these activities require some form of change management and process transformation which always takes significant effort to implement. A second reason is that when a strategic plan is developed, the monitoring processes for implementation are either forgotten or neglected. The plan starts off strong, but the enthusiasm quickly diminishes because nobody really knows what progress is being made; and without progress monitoring, deviations from the plan are not even being recognized. Therefore, a well-defined monitoring process should be a mandatory part of every strategic planning discussion. The question is, what characteristics should such a process have? For one, it should be multi-dimensional, meaning that it should not only measure financial information but also consider other aspects. It should also be easy to communicate within the organization, and obviously, it should link to the strategic plan that was created. This perspective measures the business value that is being generated by IT. Measurements can be reflected in functionality or projects delivered on time and within budget. Value is also measured through productivity improvements, efficiency contributions for processes, and general service level achievements. The financial perspective measures the budget performance as well as the performance of all projects within a program. The financial perspective should have a strong primary focus on business value generation and should not focus solely on cost savings. This perspective examines the core processes that contribute to achieving the objectives related to generating business value. It not only analyzes existing processes but often introduces new processes to better serve the business and identifies processes that should be eliminated. It considers innovations and improvements that could be applied to improve general IT effectiveness. Such processes could include the implementation of agile methods, the introduction of DevOps, and streamlining service desk activities. The learning and growth perspective addresses three areas. The first is IT staff development and growth. The second focuses on IT infrastructure and effectiveness of the use of technologies. This should include an assessment of the effectiveness of the enterprise architecture, which is an integrated part of an IT strategic plan. The third focuses on organizational capital readiness, which includes organizational capabilities and the readiness to undertake transformations required to achieve strategic objectives. One major benefit of the balanced scorecard is that it does not require technology or applications to be implemented to use it. Management can easily establish the right measurements, determine the right KPIs, and start using this approach without major investments or commitment of resources. Therefore, it only makes sense to venture to explore the balanced scorecard and learn the significant benefits it provides. The other benefit is that the balanced scorecard is totally integrated into strategy maps also developed by Kaplan and Norton (Kaplan & Norton, 2004). These maps provide a method to develop an IT strategy. Strategy maps and balanced scorecards are tightly coupled and together deliver an essential tool set that should be part of every IT management team. Kaplan, R. S., & Norton, D. P. (2004). Strategy maps: Converting intangible assets into tangible outcomes. Boston: Harvard Business Review Press. Kaplan, R. S., & Norton, D. P. (1996). 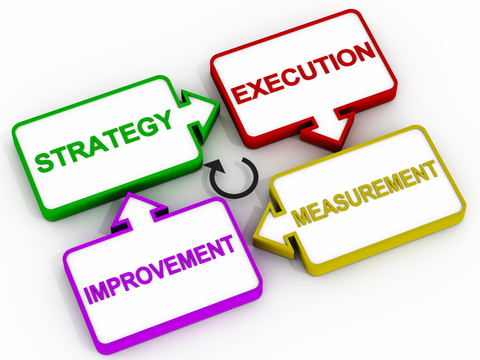 The balanced scorecard: Translating strategy into action. Boston: Harvard Business School Press.